CP3 All Stars Looking To 3 Peat! 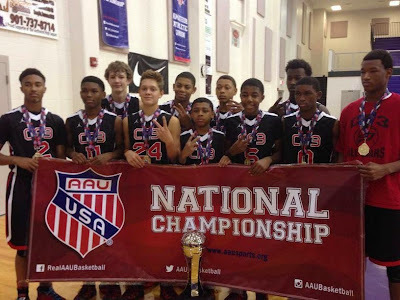 Winning an AAU National Championship is one of the hardest feats in youth basketball. It becomes the pinnacle moment for most coaches that get to this level. Therefore if a coach is capable of winning back to back crowns they have to enter legendary status. That being said we sat down with AAU Coaching legend and reigning back to back national champion Keyford Langley. He gave us some insight on their past and upcoming season. BS: How did it feel to win back to back national championships? BS: What were some of the obstacles the second time around? KL: The first obstacle was having the pressure of repeating. Playing against the odds, history of a repeat was not on our side. Playing in the biggest tournament of the season without our #1 guy, Wendell Moore. Man, I had sleepless nights leading up to the tournament. He does so much for our team, there was no way to replace his productivity. The one thing that people did not consider was the heart, skill set and the mental toughness the other kids on the team have. These kids have been through the fire so to speak. Some of the players like Keyshaun, Kobe, Mike, Nick, Jeremiah were in the National Finals (4th grade) before w/o Wendell. We also lost a game in pool play against the City Stars (Ca.). Super guards and a great coaching staff are from that team. Much respect to that group! We had to mentally get ready to keep competing when we lost. We knew that the City Stars had a unique team and they just competed until the end. We also knew that we still had a chance after the lost. Playing against teams that we just played against 4 weeks prior to the Nationals…AOR and George Hill. Two major competitive teams in the country. AOR had not lost a game up to that point. BS: With so much winning in your program how do you keep the players motivated? KL: Honestly, I can’t take credit for their motivation. Each season, people leave us out of the conversation when it comes to winning it all. Even in our state of NC, there are individuals who continue to think and publicly say that we are not the team to beat. Those individuals still don’t get it. Each year, kids re-class and join a team in hopes of knocking us off in the NCAAU tournament. Our kids read and listen to the disrespect and how we get overlooked as being a good team. They take this personal and love to prove others wrong. They play with a chip on their shoulder. We also have very humble kids. They only give their best and compete. They hate to lose more than they love to win. BS: It’s always an interesting dynamic when coaching your son, how is it coaching two sons together? KL: Mike, coaching your child is the most challenging thing I have done. You stand the chance of destroying the father-son relationship, people want to say you are playing daddy ball etc… On the flip side, it has been very rewarding. We leave all basketball “talk” in the gym. I don’t just focus on their development; all of the kids get coached up. Keyshaun and Kobe loves to compete and they are like sponges. They listen and give you what you want and then some. They have also given me extra grey hairs as well (lol), but it has been an honor to coach them since they were 6 years old. BS: Word is highly touted players Myles Pierre and Chris Hinton have come aboard, how will these pickups affect your squad? KL: Myles joining us will put us at another level. This kid has done a great buying into our team concept. He plays with such a high motor it is unbelievable. His energy is contagious. Myles has improved in so many areas, rebounding, shooting, ball-handling, decision making and defense. He is a perfect fit for us and he will also benefit from joining our team. Chris gives us an instant low post threat. Our team never had this type of elite play in the post. He’s also a very welcomes addition. BS: What are the benefits of playing with an organization such as CP3? KL: The family concept of CP3 is the biggest benefit (God, Family, School, and Basketball). The connections and how they nurture these kids was huge in our decision in becoming a part of this organization. They are able to connect our kids with people that can help develop them on and off the court. Lastly, the idea of maybe being able to play/being a part of the EYBL is a major. At the end of the day, it’s about getting the scholarship dollars and developing productive young men. BS: Wendell Moore is regarded as one of the top prospects in the country, How has the experience been coaching him? KL: Mike, you saw him 1st when he was in 4th grade in Concord, NC playing with us (Gaters) in the Spotlight/Spiders tournament. The kid has “it”. He always seems to make the right/big plays. He is a coach’s dream. With such a high basketball IQ and skill set, Wendell has become a major problem for opposing teams. I enjoy coaching him and being around him off the court. He is a quality kid. BS: It’s been a few years since the last time you played in a Spotlight event; do you look forward to the AC Showcase and the Carolina Collision? KL: I always look forward to your events Mike. I know you will have quality teams that are ready to compete. Your reputation exceeds our expectation when it comes to tournaments. We are excited to go against some of the best teams in the country. BS: What can we expect from the CP3 All Stars this season? KL: Our team will continue to compete and leave it all on the floor. The players have gotten bigger, stronger, faster, and their skills continue to develop. You will see a more determined and focused team. We have upgraded the roster and the expectations that we set for ourselves are high. We also added a dynamic young coach, Dominic Bishop, to our staff. He is one of the best young trainers out there. The kids respond to him and will go through the wall for him. Our 2015 Motto is “All In”. BS: What are your chances of a 3 peat? KL: I like our chances a lot especially when other teams over look us. We upgraded and the players we had last year are so much better. Winning it all is not our goal, we just want o get better and if the result is a championship then that would be special. We are gearing up for another productive season. The Formula For Success is there and the kids are buying in.